Motorola's slogan for the Motorola MTP3250 is "Designed to work in the toughest, most demanding environments, day in, day out." And they mean it. Its Motorola technology is optimised for maximum toughness and durability, and the Motorola MTP3250 also features GPS, intelligent audio and Bluetooth capability. The latter is convenient when freedom of movement is required. For those moments, the MTP3250 can even connect to Bluetooth headsets like the ones we offer as accessories. Like our other TETRA two-way radios (including, among others, the Motorola MTP850S and Motorola CEP400), the MTP3250's full range of functions come into their own when the device is used within a TETRA-cell radio environment. 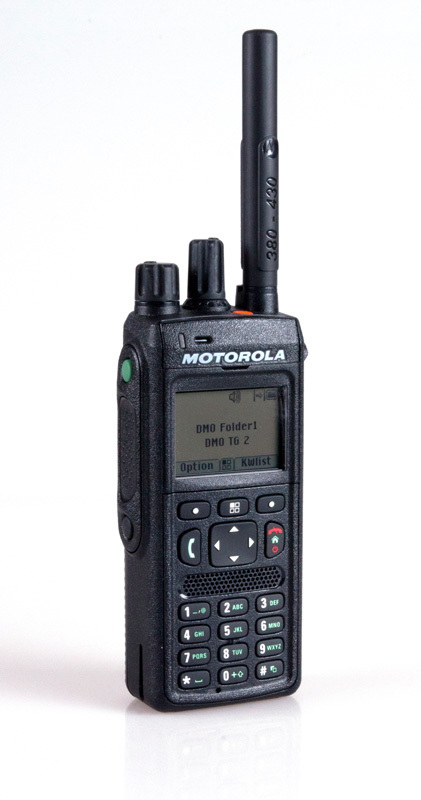 Our rental range features the Motorola MTS1 TETRA Cell, among others. The MTP3250 also supports back-to-back communication (i.e. direct radio contact between two-way radios), but if that's the only function you're looking for, a TETRA device is more radio than you need. We'd recommend checking out our digital DMR two-way radios, like the Mototrbo SL4000 or the Mototrbo DP4600. Based on the standard-setting technology used in the Motorola MTP850S, the Motorola MTP3250 offers a variety of useful and well-thought-out features. For over 80 years, Motorola has been the leader in voice transmission. This is one of the principal reasons we've relied exclusively on Motorola two-way radios and their superb sound quality since 1999. Like the SL4000, the MTP3250 features an intelligent audio function, so speech comes through loud and clear. The MTP3250 filters out annoying ambient noise so accurately that speech comes through distinctly, even in the noisiest surroundings. Supporting this function: a wide range of headset accessories, like our Helicopter Headset. The design of the Motorola MTP3250 makes it even better than the Motorola MTP850S for use in the largest talkgroups. Its usability is a distinct improvement upon that of predecessors, the MTP850, MTP850S and CEP400. It comes with two multi-function rotary knobs, directly accessible phone lists and sensibly sized buttons. Learning to operate the MTP3250 won't take long, even for inexperienced users. Motorola designed the radio to be as intuitively easy to use as a mobile phone. Like other MTP series TETRA two-way radios, the MTP3250 features an air interface protected by class 1, 2 and 3 encryption. Authentication security has also been retained. Communication security in the OTAR/DMO SCK area has been enhanced. In addition, the MTP3250 features SIM encryption, and the radio can be permanently or temporarily disabled. In our opinion, the MTP3250 exceeds the German Federal Office for Information Security's standards for secure communication. We consider it the most secure two-way radio in our inventory. Motorola developed the MTP3250 using military standards, subjecting the radio to endurance tests that simulate 5 years of the toughest use. So, the MTP3250 is supremely qualified for harsh outdoor service, or daily use on large construction sites, in manufacturing or in chemical plants. The Motorola MTP3250 has a GPS chip, allowing you to make good use of professional dispatcher tools. Using GPS and appropriate software (we'll be glad to advise you as to which software is best for your needs), you can get a clear overview of the position of each individual radio within a cell. This allows you, for example, to assign a work order to the employee who is closest to the task's location. Like all the Motorola two-way radios that you can rent from us, the MTP3250 possesses super-strong receiver sensitivity. In addition, the signal strength can be switched from 1 to 1.8 watts, allowing the MTP3250 to keep transmitting to the cell even as its little sisters from the MTP and CEP series reach their physical limitations. The MTP3250 features a display with a resolution of 132 x 90 pixels and can display 26,200 colours. Another very helpful feature is the day/night mode; it automatically adjusts the brightness of the MTP3250's display to match the ambient light, ensuring glare-free legibility at night. Motorola claims that its 1,850-mAh MTP3250 battery can last about 16 hours over a 5/5/90 duty cycle, and 12 hours over a 5/35/60 cycle. We believe these claims are somewhat optimistic. As a rule of thumb, we'd estimate that a well-maintained 1,650 mAh battery powers the MTP3250 for 10 hours, given moderate radio traffic. The duty cycles mentioned above (e.g. 5/5/90) relate to the way the MTP3250 is used. The first number stands for the percentage of time the radio is transmitting (i.e. speaking time), the second number represents the percentage of time the radio is receiving (listening time), and the third number shows the percentage of time the radio is standing by (waiting time). So 5/5/90 means 5% of time speaking, 5% listening and 90% on standby. We offer Motorola MTP3250 TETRA two-way radios in the 380-430 frequency range. If you prefer frequencies in the 806-870 range, please let us know when submitting your inquiry. Compared to our DMR (digital radio) offerings, TETRA radio is significantly more complex. We'll be glad to provide reliable advice, free of charge and without obligation, and to assist you in all aspects of the design and delivery of your TETRA radio system. Of course, you can rent nearly any amount of individual MTP3250 units from us - to handle your busy season, for the Christmas rush or other temporary uses, and we'll be glad to provide you with accessories (headsets, replacement batteries, TETRA cells) as well. Whatever your requirements, we look forward to receiving your request for consultation and/or rental. We're here for you anytime, just e-mail us at mail@Radio-Rental.com or phone us at +49 30 29381970. The same applies to our Enterprise Service package, which we're happy to offer for all your production-critical radio applications.